Rare Limited Edition 20" Red/Chrome Bikes W/ Highway Pegs! Orange County Choppers and Schwinn have combined to produce one of the coolest bicycles ever brought to market. It has a wide, motorcycle-size rear tire and a riveted saddle seat. The custom-stretched chopper frame includes a wedge-shaped piece of metal where a motorcycle's gas tank would be. The bike even parks like a real motorcycle, thanks to a double-leg kickstand that raises the front wheel when locked down. A closer look reveals amazing detail. The word "Sting-Ray" in white lettering on the tires. Black dice inner-tube caps. Clear-coated flame decals. The Sting-Ray weighs a healthy 45 pounds and feels like it would last forever. This chopper is a great cruiser. Schwinn is producing just 3,500 of these first-edition Sting-Rays. These are destined to be sought-after collectables like the old Schwinn Sting-Rays of the 1960s and '70s. Here's a chance to buy one for yourself as an investment while the price is still affordable. Or get one for your kid so he or she can have the coolest ride in the neighborhood. Remember, the chrome bikes are the only models with front fenders and front foot pegs. The black, blue, green and red bikes have no front fender. Part chopper. Part cruiser. 100% muscle bike -- The new Schwinn Sting-Ray is an exciting, chopper-style ride. Built with customized parts -- like the Big Boa Rear Tire and signature V-back Handlebars -- it's no wonder Schwinn Sting-Rays are endorsed by Orange County Choppers. Straddle the saddle and hit the pavement... the rebirth of cool has arrived. *Custom stretched chopper frame with gas tank and gusset. 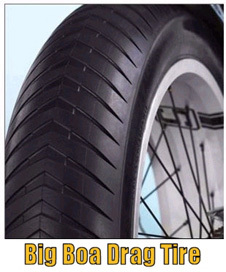 * 20" x4" super wide V line rear slick tire. * 24" x 2" narrow front tire mounted on extruded alloy rims. 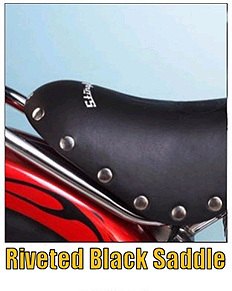 * Adjustable cruising saddle with built in sissy bar, riveted upholstery and Schwinn embossed logo. * Dual crown Sting-Ray twin barrel chrome forks with color matching paint. 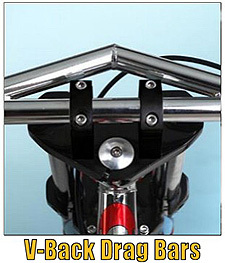 * Chrome steel chain guard and heavy duty double leg kickstand. * Clear coated Schwinn flame decals with machined aluminum head badge. * Alloy linear pull brake with alloy lever. * 3 piece custom Sting-Ray cranks with iron cross pedals. * Sporty and stylish front fender. * Highway front foot pegs. It all started in a little chop shop near Madison, WI. 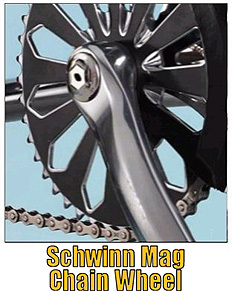 A couple of Schwinn engineers had a vision for a revolutionary bike. One that would take its cues from the great American chopper. With a raked-out fork, knees-to-the-breeze seat position and enough bad-boy character to raise eyebrows, their creation was no ordinary bike. Like its namesake, Schwinn's newest creation was born from one desire: to create something totally different, something that only the newest generation would appreciate. And so, a new breed of Sting-Ray was built for a new breed of rider. Discover the bike everyone is talking about. It's the Rebirth of Cool. Born from the classic Schwinn Sting-Ray of the 1960s and '70s, the new Schwinn Sting-Ray is an exciting, chopper-style ride. It features V-Back Drag Bars, a knees-to-the-breeze low-ride saddle, a unique wishbone kickstand and the signature Big Boa Tire -- just like a motorcycle! These awesome bikes are HARD TO FIND, Sold Out Everywhere! Email us and buy a chopper today! TO BRING BACK THE STING-RAY January 23, 2004 -- MADISON, WI - Schwinn bicycles, one of America's favorite and most recognized brands, has joined forces with Orange County Choppers, the company that has garnered worldwide recognition for building custom motorcycles and is featured on the popular Discovery Channel show "American Chopper," to create customized Schwinn Sting-Ray bicycles. The Schwinn Sting-Ray, widely regarded as the most popular bicycle ever created, is returning to stores for the first time in more than 30 years. The new Sting-Ray sports a contemporary design that takes its cues from great American motorcycles. To commemorate the redesign of this classic, Schwinn has partnered with Orange County Choppers (OCC) to use the OCC logo on all editions of the new Sting-Ray for mass retail sales, as well as use of the OCC name for Sting-Ray parts and accessories. The classic Schwinn Sting-Ray was introduced in 1963 and remained on the market until 1979. There were essentially four models: The basic Sting-Ray; the Sting-Ray Deluxe (that added chrome fenders and white wall tires); the Sting-Ray Super-Deluxe (that added a springer fork); and the Krate series (that added a five-speed "Stik Shift," shock struts on the rear seat and had a 16" front tire and a 20" rear tire).